PW supply a range of manual and pneumatic Sunstone weld heads with parallel and opposed weld head configurations available. The WH1125 series weld heads offer precision and repeatability at an affordable price. The WH1125 weld heads offer opposed, or series, weld electrodes and are ideal for general fine spot opposed resistance welding. Once connected, these weld heads can be adjusted for your particular application. The weld head’s electrode force can be adjusted to ensure a strong weld. Head travel height ranges from 0 to 5.25 inches. The WH1125A weld heads are pneumatic weld heads that require an air compressor. Any size compressor will work since the weld head comes equipped with a pressure regulator. Once connected, the air pressure and head travel speed can be set to any preference. 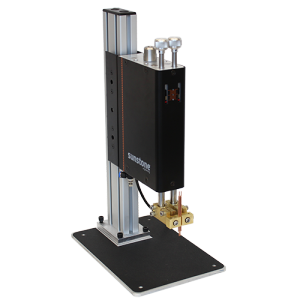 Welds are quickly and easily made with each compression of the included foot pedal switch. The WH1125M weld heads are manually operated. These weld heads require manually lowering the weld head’s electrodes by means of an extension lever and pedal. Pressing on the pedal results in smooth vertical head travel for precision and control when welding. WH1125 weld heads are well suited for opposed / through weld applications. The WH2125 weld heads for capacitor discharge spot welders offer precision and repeatability at an affordable price. The WH2125 weld heads have parallel set electrodes and are ideal weld heads for battery pack manufacturing when used with capacitor discharge spot welders. Once connected, these weld heads can be adjusted for your particular application. Each electrode’s force can be individually adjusted to ensure a strong weld from the spot welder. Head travel height ranges from 0 to 7.25 inches. The WH2125A weld heads for capacitor discharge spot welders are pneumatic weld heads that require an air compressor. Any size compressor will work since the weld heads come equipped with a pressure regulator. Once connected, the air pressure and head travel speed can be set to any preference. 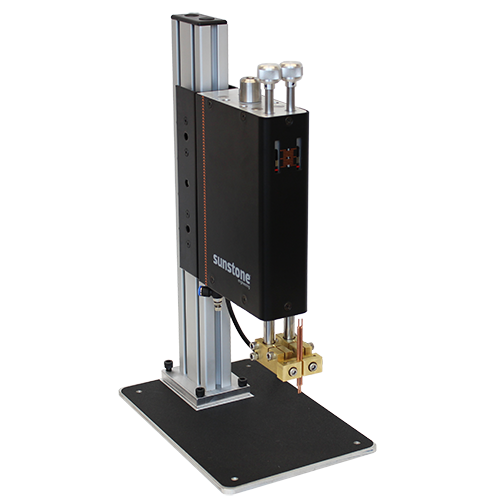 Spot welds are quickly and easily made with each compression of the included foot pedal switch. The WH2125M weld heads are manually operated weld heads for capacitor discharge spot welders. These weld heads require a manual lowering of the weld head by means of an extension lever and pedal. Pressing on the pedal results in smooth vertical head travel for precision and control when welding. WH2125 weld heads are ideal for battery manufacturing and other series welding applications. Sunstone’s new line of micro weld heads offers superior Sunstone Technology and includes many advanced features when compared to other micro weld head products. Sunstone’s Micro Weld Heads provide the ability to perform precise, low inertial welds. These micro weld heads are designed for opposed welding applications, or for delicate parallel gap welds such as thermocompression bonding, and reflow soldering. A compound lever force system ensures accurate, repeatable welding force ranging from 350 to 3000 grams. The features of these micro weld heads provide users with benefits not found with other micro, low-force weld heads. Sunstone’s Micro-joining Weld Heads provide the ability to perform precise, low inertial welds. These parallel Micro Weld Heads are designed for delicate parallel gap welds such as thermocompression bonding, and reflow soldering. A compound lever force system ensures accurate, repeatable welding force ranging from 350 to 3000 grams. The MWH3000 Micro-joining Weld Heads offer precision and repeatability at an affordable price. They come as standard with parallel gap electrodes. Once connected to a Sunstone Spot Welder power supply, these micro weld heads can be adjusted to meet the needs of a variety of applications. In addition, a variety of fixed and adjustable gap electrodes as well as reflow soldering tips are available. The MWH3000A micro-joining weld heads are pneumatic weld heads that requires an air compressor. Any size compressor will work since the weld heads come equipped with an internal pressure regulator. Spot welds are made quickly and easily with each compression of the included electronic food pedal. A trigger indicator light will display when the weld signal is received from the welder. 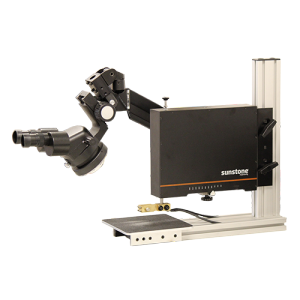 This unit is equipped with upstroke and downstroke speed controllers for precise positioning and electrode placement for both low speed and high speed production runs. The MWH3000M micro-joining weld heads are manually operated weld heads. These weld heads require a manual lowering of the weld head by means of a mechanical cable pull foot pedal. The MWH3000M weld heads have a slightly lower initial cost and are well suited for light production runs. 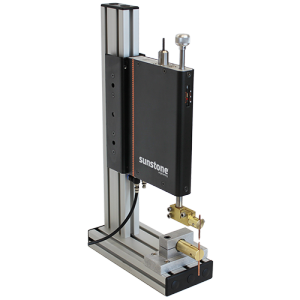 Sunstone’s New MWH3000 Opposed Micro Weld Heads provide the ability to perform precise, low inertial welds. These Low Force Micro Weld Heads are designed for delicate opposed or through-welding applications. A compound lever force system ensures accurate, repeatable welding force ranging from 350 to 3000 grams. The MWH3000 features Sunstone Technology which provides users with benefits not found with other micro, low-force weld heads. The MWH3000 Low Force Micro Weld Heads offer precision and repeatability at an affordable price. They come as standard with opposed set electrodes. Once connected to a Sunstone Spot Welder power supply, these micro weld heads can be adjusted to meet the needs of a variety of applications. In addition, a variety of other constant force electrode accessories are available. The MWH3000A opposed low force weld heads come equipped with an internal pressure regulator for use with an air compressor. Spot welds are made quickly and easily with each compression of the included electronic food pedal. A trigger indicator light will display when the weld signal is received from the welder. 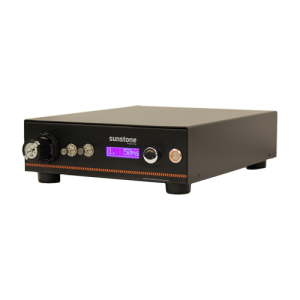 This unit is equipped with upstroke and downstroke speed controllers for precise positioning and electrode placement for both low speed and high speed production runs. The MWH3000M opposed low force weld heads are manually operated weld heads. These weld heads require a manual lowering of the weld head by means of a mechanical cable pull foot pedal. The MWH3000M weld heads have a slightly lower initial cost and are well suited for light production runs. 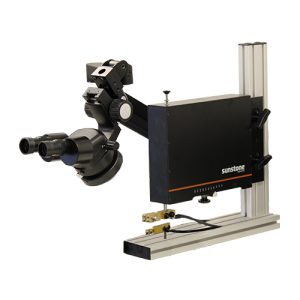 The MWH3000 does not include a microscope, however, if you would like to add one, ask about our MWH Microscope – a stereo microscope mounted on an articulating swing arm, and has magnification options ranging from 5X to 20X zoom available. The purpose and benefit of the ACS is to provide users with a simple and easy-to-use solution when setting up and performing welding operations. The ACS’s menu system is displayed on the front of the unit, and allows users to customize up to 10 independent variables for each weld sequence. Once the weld control parameters are entered, the ACS will follow through the weld sequence and ensure that weld procedures are consistent and repeatable. Ability to chain several ACS modules in order to control multiple power supplies for sequential welds.